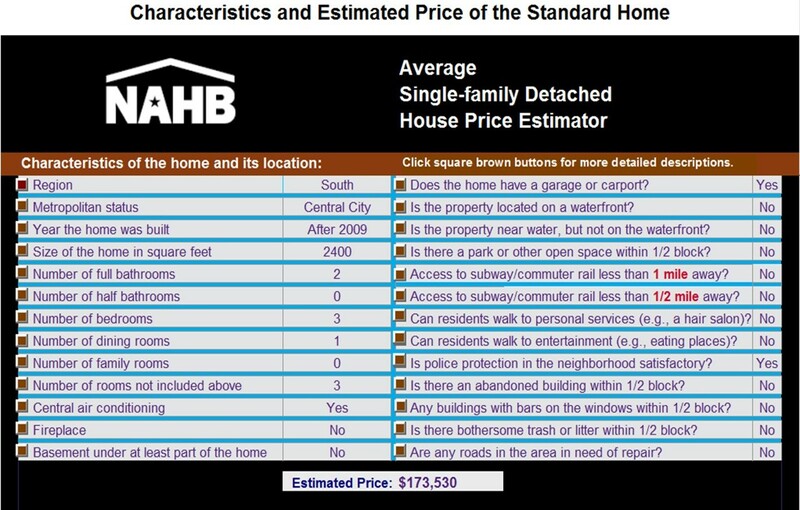 Since 2004, NAHB’s interactive model for estimating the price of a single-family detached home has been available online for those who would like to use it. The latest version of the house price estimator has just been released, calibrated by NAHB with data from the latest (2013) installment of the American Housing Survey (AHS, funded by HUD and conducted by the U.S. Census Bureau). A recent article provided details of the new estimator and examples of how it can be used. One example is a recently built home with a standard set of features in a southern central city. The estimated price of this home is $173,530. A reproduction of the inputs and estimated price appears below. The output of the estimator is therefore an average price for a home with certain features across one of fourteen relatively broad geographic areas. 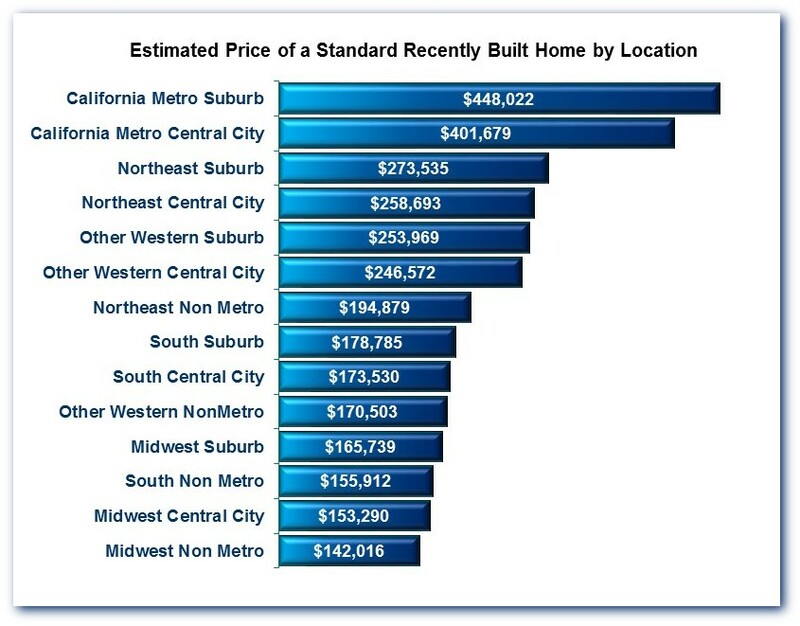 The graph below shows how the price of the standard recently built home (as defined above) varies across these fourteen geographic areas. One use of the estimator is to tweak the home’s configuration and see what happens to its price. 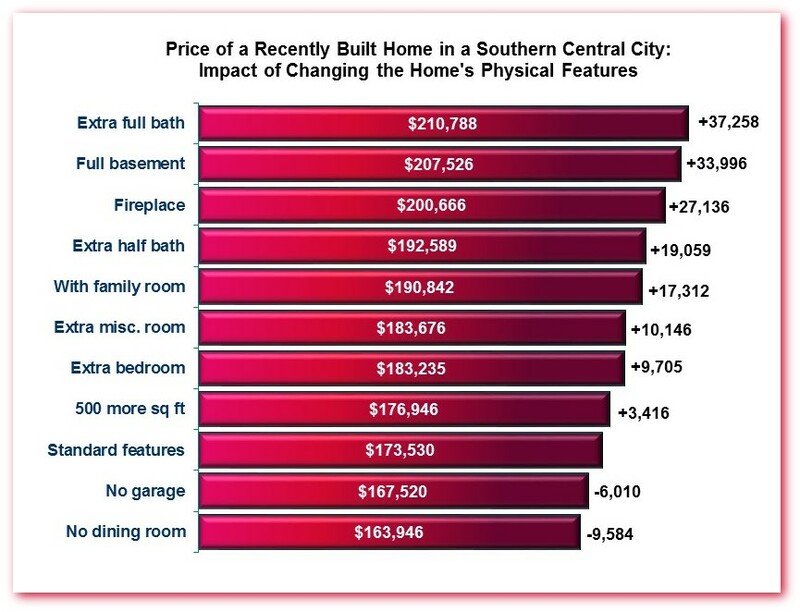 The chart below shows what happens to the estimated price of a standard recently built home in a southern central city as some of the home’s physical features are changed one at a time. Of the features shown in the chart, the largest impacts come from adding a full bathroom (which increases the estimated price of the standard home by about $37,000) a basement (increasing the price by $34,000) and fireplace ($27,000). The full article provides more examples, including the price impacts of neighborhood characteristics, and discusses the estimator in more detail. Readers who would like to experiment and create their own examples can access the online interactive House Price Estimator on NAHB’s web site. The online interactive version of the estimator is a “macro-enabled” Excel file that requires a fairly recent version of Excel, with security adjusted to allow macros to run. Readers accessing the house price estinator should start on the landing page and read the instructions at the bottom before clicking on the link that actually opens the estimator.